One evening last week I took Cooter to swim lessons. 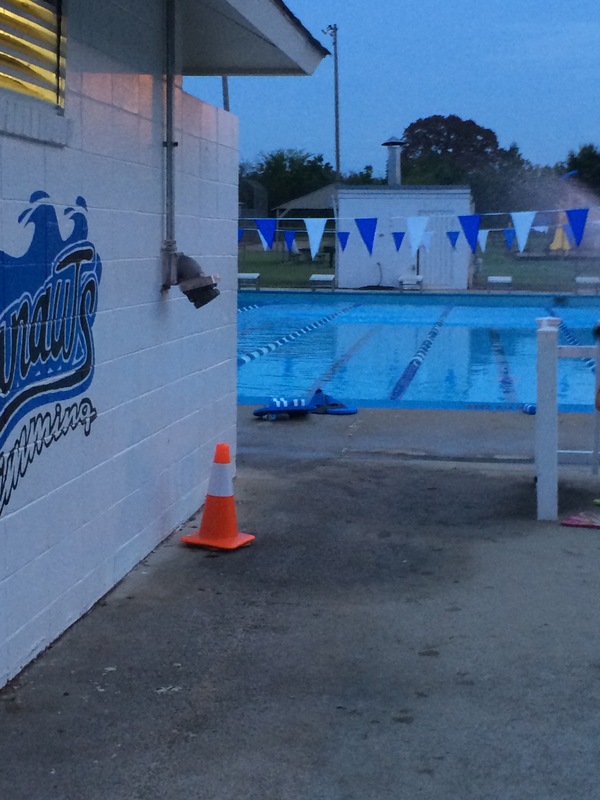 It was a quiet night since there had been no swim team practice earlier. It was just the children taking lessons, and…..
a group of ladies about to get in the pool. Our children taking lessons were in two of the three far lanes. These ladies walked over and started getting in the first four lanes. They spread out and all faced the one woman in the fourth lane. That’s when it hit me–water aerobics. They were all shapes and sizes and ages. Some with hats and some without. Some with bathing suits on and others with shirts and shorts covering up their suits. Out of the eight or so women taking the class, it was obvious that for a couple of them it was their first time. The gate. A place to lay it all down and see where you can get without that heavy weight of ego. I love this woman, you know? Today I thought back to her and her class, hoping to catch a bit of her pep talk tonight during Cooter’s swim lesson. Then I remembered she told the other ladies there wouldn’t be class tonight. It’s her anniversary. I hope she’s having a blast. From what I saw of her passion for laughter and life, I am sure she is. What would I do if I checked my ego at the gate? If I wasn’t worried about failing? About what others thought? What would I venture out and try? What would I say I could not live another moment without knowing about? And would I go after that knowledge, that adventure…..if my ego wasn’t in the way? Tonight I’m thankful for the water aerobics teacher who challenged me to step outside the box. It’s not a comfortable place to be, but it is fascinating and mesmerizing. I’m dreaming a little bit today just because of those words–no worries, egos are checked at the gate. Yes. That’s really good stuff right there. What if? I hope you all take a moment today and ask yourself that same question–what if you checked your ego at the gate?–and then dream big and start to work making that happen. Imagine the adventures we all could be having. All the things we could be doing…..
Love and wishes for big chase-able dreams to all.